Quality structured cabling is key to an effective network infrastructure. Just as building a house starts with a good foundation the cornerstone to a solid network is the structured cabling. Structured cabling is how VCT started in the industry and we are passionate about this being the first step of a properly designed network. We do not contract out our cabling work, all cabling work is designed in-house by our team of seasoned and skilled, well-trained employees. BICSI certified and manufacturer trained technicians with proper tools and test equipment are prepared to do the job right the first time. Structure cabling projects from VCT are properly designed, documented and installed. At the completion of the job, you will receive a printout that shows drop locations, number and cabling test results. All faceplates and patch panels are clearly labeled for your convenience. 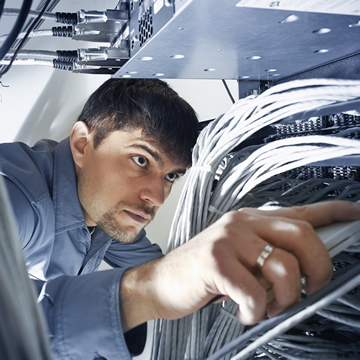 IT professionals routinely waste thousands of hours attempting to diagnose network problems that are directly are related to improper cabling methods. Network problems due to poorly terminated copper and fiber can be difficult to track down and ultimately result in increased deployment and maintenance costs for the customer. Companies who choose VCT routinely avoid these headaches and unnecessary expenses. Voice and Data Cabling: Network cabling is the cornerstone of your organization. We use only the highest quality components and test equipment available and follow strict installation and testing guidelines. Fiber Cabling: Businesses with multiple buildings and high square footage require fiber. Our skilled fiber technicians combined with high-quality fiber lines, results in a highly effective fiber cabling implementation. Aerial and Buried Cabling: The aerial and directional boring capabilities of VCT makes us the perfect choice to install your campus backbone or long-haul connectivity. Coax Cabling: Coax serves as a critical piece of many networks, typically providing high fidelity audio, television, satellite and broadband communications. Twisted Pair Cabling: Unshielded Twisted Pair (UTP) has been designed for legacy voice services, but is also used for monitoring, access control, burglar alarms, and I/O contact applications. Fiber Splicing: Our expert technicians use only the latest equipment to guarantee the highest performance in fusion and mechanical splices. ASK ABOUT INCLUDING CABLING IN YOUR CUSTOMIZING MANAGED SERVICES PACKAGE!